The spice giant has some big questions to answer in its upcoming earnings report. McCormick (NYSE:MKC) will announce its fiscal first-quarter results before the market opens on Tuesday, March 26. Shares dropped immediately following the spices and flavorings specialist's last report back in January, but have since recovered nearly all of that decline. That rally raises the stakes for McCormick to show solid demand and profitability trends for the quarter while at least confirming its broader 2019 outlook. Let's dig into the details that investors will be watching in Tuesday's report. Sales gains slowed at the end of McCormick's 2018, with its 2% uptick falling short of the 4% growth investors had been used to seeing. All of that growth came from average price increases, too, as its sales volumes held steady. But management's comments following the report suggested there's little for investors to worry about regarding demand trends. The slowdown was mostly driven by one of McCormick's largest U.S. retailing partners paring back on inventory during the holiday season shopping crush. Customer sell-through, on the other hand, continued to grow at a healthy clip, executives said. This report should help clear up whether that inventory move was a temporary setback or part of a more disruptive shift by this customer. If it's the latter, then McCormick might simply affirm, or even downgrade, its latest sales outlook that calls for organic revenue to rise by 3% in 2019, matching last year's expansion pace. Check out the latest earnings call transcript for McCormick. The profit outlook isn't as cloudy. In fact, McCormick is benefiting from several trends that are working together to steadily boost its earnings power. These include a shift in demand toward higher-margin condiment sales and cost savings achieved by the integration of its new French's and Frank's brands. Its flavorings niche is also well-situated to outgrow most of the wider consumer packaged foods industry. Thanks to these successes, gross profit margin rose to 44% of sales last year from 42%, and McCormick's consumer and flavor solutions segments both posted healthy bottom-line margin gains. Overall, operating income jumped to $903 million, or 16.7% of sales, from $702 million, or 14.5%, in the prior year. CEO Lawrence Kurzius and his team are predicting another year of higher margins in 2019, with earnings rising a bit faster than their annual target of around 10%. That outlook might edge higher if robust demand supports firmer global pricing. It could creep lower, though, if McCormick's sales gains continue decelerating. Investors who look beyond the volatility of those short-term sales and profit swings will see a business that's notching fundamental improvements across several important categories. 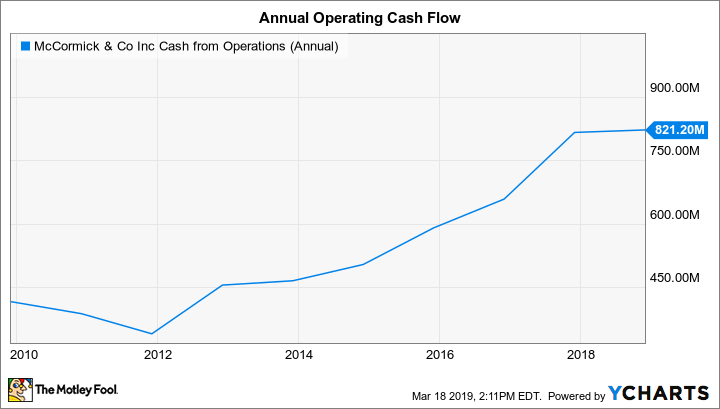 The best single metric to illustrate those wins is annual operating cash flow, which last year improved to $821 million from $815 million and marked the seventh straight year of record results. MKC Cash from Operations (Annual) data by YCharts. Management chose in 2017 to direct a large chunk of that cash toward acquiring the French's and Frank's condiment and sauce businesses, and to date that $4 billion purchase has delivered solid returns for investors. Healthy cash flow in 2019 should allow management to quickly pay down the debt from that purchase so that the company can return to its prior pace of aggressive stock buybacks -- or additional major acquisitions -- by as early as 2020.